Black and White Outfit - How to wear black and white? Black and White Outfit – How to wear black and white? New fashion trends come and go with every passing season. As pointed out by Vogue, trends tend to be seasonal, and at each of the year’s fashion weeks, designers are sure to include street-syles, or more wearable designs. That’s just the nature of the industry: designers have to keep churning out new fashions every season in the hopes that something will catch on. Each year in London, New York, Milan, and Paris, there are fashion weeks held so that designers can display their latest trends. Often, it can take months for trends seen on the runway models at fashion week shows to make it to the racks where people actually shop, but if one thing is for certain, it’s that the black and white combination is timeless. Because black and white are both neutrals, most people normally have at least one item of clothing in each color. Wearing them together might not be the first thing that pops into our heads, because when we think black jeans, we know any top will go, so we don’t reach for the safety of the white blouse. But in fact, the drastic effect created by pairing white with black can really make a bold statement, without risking being out of style. In part, the black and white trend seen in women’s clothing hearkens back to the timeless simplicity of tuxedos (think James Bond here). On women, black and white outfits are the kind of fashion that is great because it is bold and confident, but also understated. Plus, it’ll never go out of style. For work, think about channeling chic simplicity. How about black trousers, black pumps, and a feminine white blouse, with either a sweater or a blazer over it and some jewelry? Personally I would chose some filigree rings and necklaces to set stylish statement and not to look like too square. Marks & Spencer claims “simple but timelessly stylish, trousers are a wardrobe must-have,” and any working woman knows this to be the truth. With easy care products becoming more and more widely available, even in high-fashion outlets, it’s never been easier to own a great pair of trousers. This one’s easy. How about a little black dress? According to Scwarze Welton, though Coco Chanel did not invent the cult of the little black dress, she is responsible for making it a timeless classic. There are lots available now with white accents, or you could go bolder and get a black and white color block dress to go out in. For a more casual take on black and white trends, think about pairing black skinny jeans with white top of your choice, or a white dress in summer with a black bag. 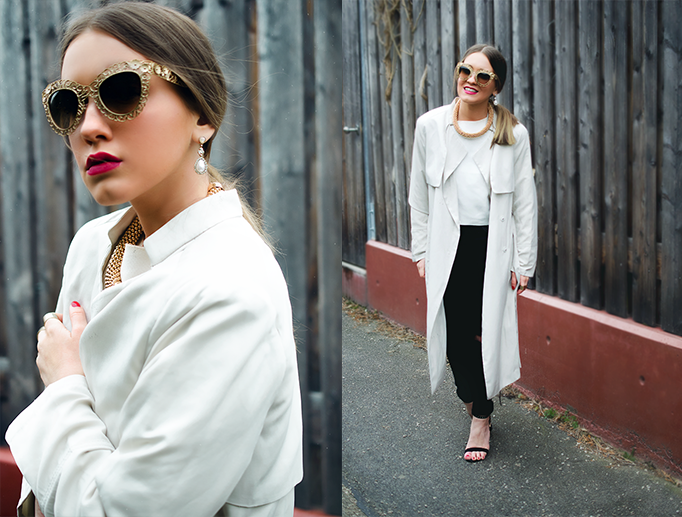 White pants with a black top is another bold way to rock this timeless trend. The current trend in upscale designers with regard to black and white seems to be over-sized black frocks and a-line-skirts with some white detailing paired with white shoes. White shoes are a bold and daring fashion move, but when worn the right way, it’s a great look sure to turn heads. No matter what your particular taste is, there is sure to be a black and white outfit for you that’s versatile, comfortable, and timeless.